The Duc de La Rochefoucauld was a French author and philosopher (1613-80). After several particularly difficult years which saw him betrayed, injured, imprisoned, plagiarised, impoverished and libelled he decided to retreat to the salons (living rooms) of the Comtesse de Lafayette and Marquise de Sable (two of the leading intellectuals of their day). Here he found himself in the company of artists, writers, poets and thinkers. There was no room for pomp, so he realised he had to find another way to be heard. Philosophers at this time communicated their wisdom and theories in big, expensive books. However, large proportions of the population couldn’t read or didn’t have very much money. He saw this medium was not conducive to ideas spreading, having reach or impact. So in the salons he came up with an idea for one-line philosophies, something short enough to be remembered and passed on by word of mouth. He tweaked these [Twitter length] aphorisms based on his audience’s reactions, like a comedian writing a ‘bit’. This culminated in his famous book, The Maxims, one of the true masterpieces of philosophy. Put more eloquently by modern philosopher, Alain de Botton, “Twitter gives us the opportunity to put La Rochefoucauld’s genius in to action in our own digital salons”. From this perspective Twitter still has great potential as a platform for sharing ideas, even if the wider population creates a lot of white noise. To formalise this idea, I distilled de Botton’s sentence into something visual, an artwork as a symbol. 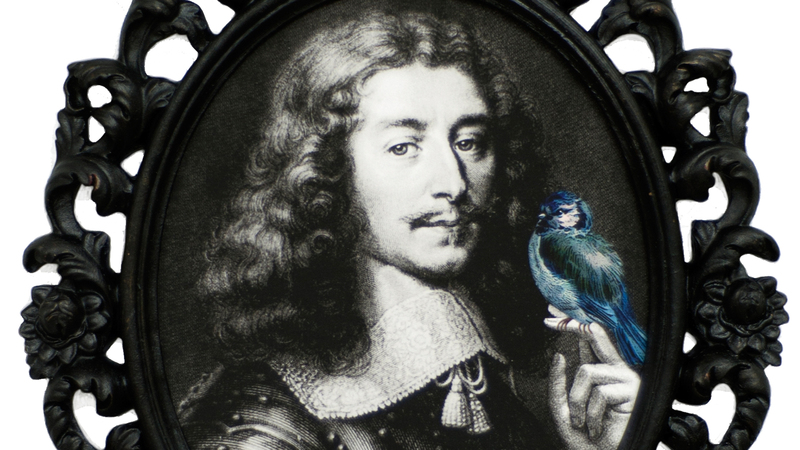 With the regal portrait prevalent in 17th century european art I decided to re-appropriate an etching of La Rochefoucauld, adding the blue bird (representing the Twitter logo) and the hand upon which it perches. This builds on a tradition in portraiture whereby subjects are pictured with symbolic objects denoting wealth, profession or circumstances. Monochrome images allude to the past (particularly in cinema and photography), whilst colour images are seen as ‘modern’ (post-industrial revolution). So here we see La Rochefoucauld in the past with his offering to the future ready to take flight, a man ahead of his time. A choice was also made to produce it as a digital print, a nod to Warhol highlighting our modern ability to endlessly reproduce.